Home / Social History / Throwback Thursday - Ajala The Traveler. Throwback Thursday - Ajala The Traveler. Almost everyone has heard of Ajala the traveler, the famous globetrotter who visited a number of countries using nothing but his bicycle. 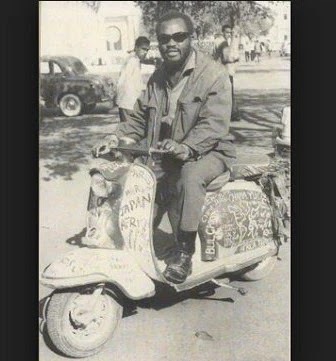 His real name was Moshood Adisa Olabisi Ajala, popularly known in Nigeria and across the globe, as ‘Ajala the traveler‘. 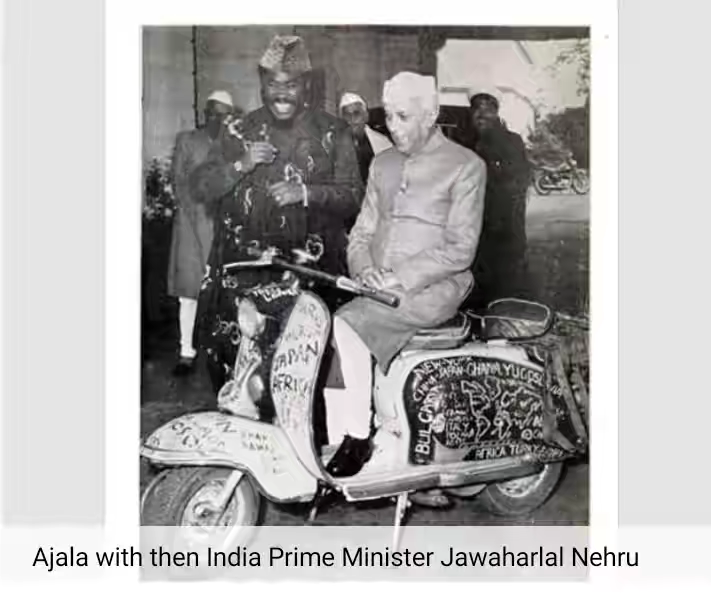 He was the man who toured the United States of America on a bicycle, and the world, on a motor scooter better known as a Vespa. Ajala was born in Ghana into a Nigerian polygamous family of thirty. He was one out of the twenty-five children produced by his father and his four wives. Shortly after Ajala’s birth, his family moved to Nigeria where he attended Baptist Academy, Lagos, and Ibadan Boys’ High School. 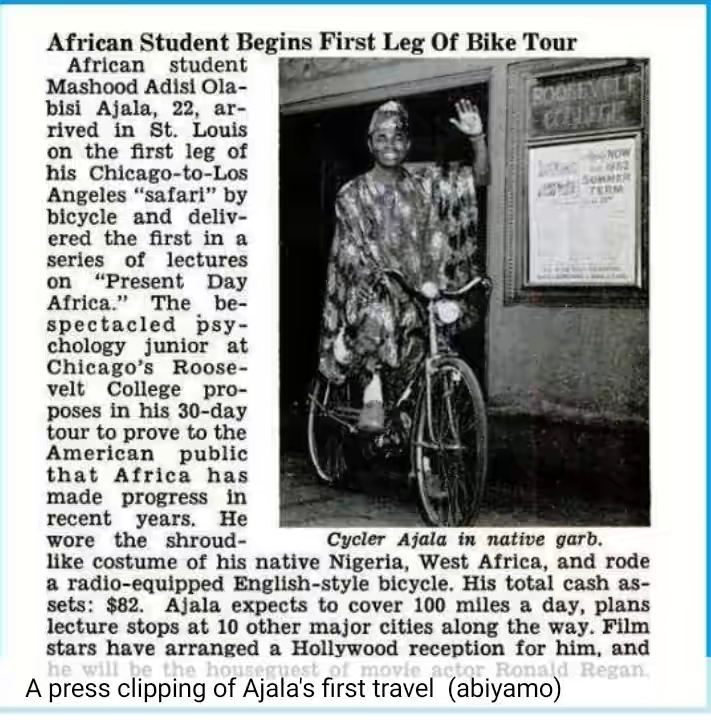 At the age of 18, Ajala went to America to further his studies; he was admitted into the University of Chicago where he studied as a pre-medical student. His initial dream was to become a medical doctor and return to Nigeria to disparage the practice of voodoo and the people’s belief in superstitions but Ajala’s lifetime dream changed along the course of his life; he found something more interesting to him than donning lab coats and using a stethoscope. Ajala was the ordinary son of a traditionalist, he rose to a global celebrity status and his name became a household name. During his prime, Ajala was envied and praised by both the young and old for his courage, determination, and success. Ajala visited 6 out of the 7 continents of the world. He visited Africa, North America, South America, Austrailia, Europe and, Asia. He also visited a total of 87 countries with his scooter in six years. He visited countries such as Israel, India, Australia, Iran, Russia, Ghana, Cyprus, Egypt and so on where he met with some of the greatest leaders in the world such as Gamal Abdul Nasser of Egypt, Jawarhalar Nehru of India, Niki Khrushchev of the USSR, Mohammad Reza Shah Pahlavi of Iran, Ronald Reagan of America, Sir Abubakar Tafewa Balewa of Nigeria and many more. Ajala fathered 17 children with different women. His wives include Myrtle Basset, a former Chicago nurse who bore his first son, Andre, Heirmine Aileen, Joan Simmons- An Austrailian, and Sherifat Ajala, mother of his last daughter, Bolanle. Despite his fame, world-famous Ajala the traveler died a poor man on the 2nd of February, 1999 at the General Hospital, Ikeja as a result of paralysis from stroke.He was 71 years old.